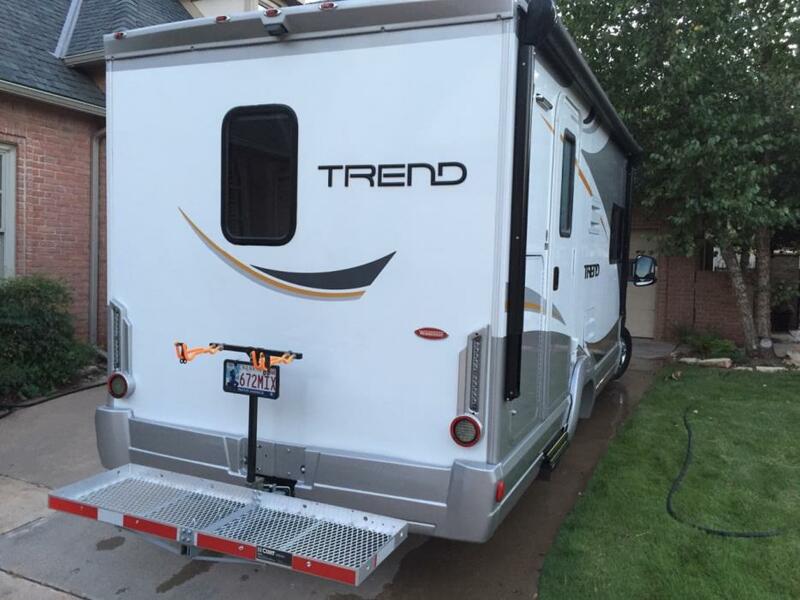 Trend 23B first time sold this year with In-Service date registered with Winnebago of April 7, 2016! Bought from California dealer, had 4,200 delivery miles on odometer by the time it reached OKC. Only slept and eaten in for two week 4,500 mile vacation in July with 3 adults and 4 very small grandchildren. Realized it might be a little small for that many people so am selling to replace with bigger coach.Couch and dinette both convert to beds (or one bed larger than a normal king-size bed). 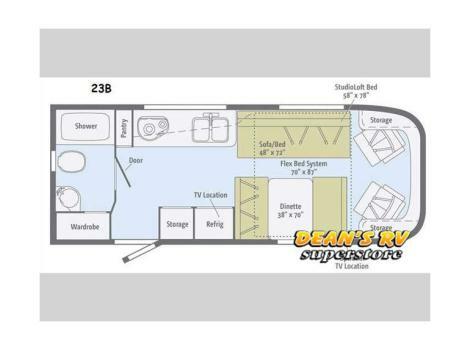 Also has queen bed (against ceiling by day and drops down for use at night).19" tv serves lower bed while upper queen uses 26" tv. Has Bluetooth, DVD player, radio, etc. with inside and out door speakers tied in with both tvs.Dash mounted screen serves Tom Tom nav system, Bluetooth, CD player, Sirius radio with surround speakers for cab, plus multiple other inputs. Cab also has several USB ports, 12 volt socket, and headphone plug. Also numerous 110 volt outlets scattered throughout the coach. All told, more than enough to handle chargers for IPhones, IPads, game players, and hand-held devices for seven people at once! Has 2800 watt gas Onan generator, roof air conditioner with heat strips, furnace, refrigerator, 2-burner cooktop, on-demand water heater that actually works when you need it. See the attached Winnebago page for complete list of all features.Trend drives and handles like a big van, easily runs over 75mph when needed but very comfortable and economical at 64-68 mph holding in 6th gear.7'6" wide and 24' long allows easy parking and service station access!Have over $2,000 in aftermarket accessories and improvements not available from Winnebago!Has correct factory spare tire mounted on roof. (Saves you from waiting for someone to find the right replacement tire to get you on the road again).Has an aluminum fold-up 20"x60" hitch-mounted cargo carrier plus separate bicycle carrier. Both attached to a custom-welded hitch mount using 1.25" AND 2" receivers side by side which frees up a lot of inside storage!Has wide running boards over entire span from mudflap to under coach body. Rear skids have welded-on steel rollers with ball bearing shafts.Trend has several cab floor hatches over batteries, etc. that need to stay dry. This one has the complete coverage WeatherTech rubber mat.Great camper for a few people, but a little crowded for seven. Am selling to go bigger!Will spend whatever time needed to demonstrate all systems and features to new owner. Can also probably save some problems for someone that has never used motorhome systems such as how to dump the tanks, connect up in an RV park, etc.Have dropped the price for a quick sale as we have found the larger coach we want to buy.Call Keith at 405 401-8061.Please don't call me to write a better ad or tell me how to finance it. Call me if you want to try it or buy it!